Welcome to the web site of the University of Central Florida Annual High School Programming Tournament! The event is organized by the UCF Programming Team, a student organization within UCF's Department of Computer Science, along with help from the UCF student chapters of the Association for Computing Machinery (ACM) and Upsilon Pi Epsilon. This web site includes information about the tournament including the contest itself, how you can participate, and past competitions (including problem sets and judge data!). We also include information on how individuals and companies can make donations to the team itself. The tournament was first held in 1987 and has been held annually (typically in early May or late April) since then at the UCF main campus in Orlando. 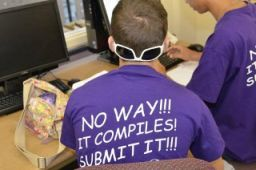 Modeled after the ACM International Collegiate Programming Contest (ICPC), we give approximately ten problems of varying difficulty to be solved in four hours. Each high school team consists of up to three students. Advisors, if you are interested in having your team(s) compete at our next tournament, please visit the Registration Page, or contact Dr. Ali Orooji by phone at 407-823-5660 or by our contact form. Students, if you are interested in competing, please discuss this with your high school computer programming teacher (or math teacher) and show him/her this web site. We welcome as many teams for which we have space! We also host an annual web-based competition, the UCF High School Programming Tournament: Online Edition. This competition is held entirely online and is an individual-based contest for high school students. This contest usually takes place on a Saturday afternoon in early winter (early February or late January). Students register and participate on their own (usually from home although some schools do organize it as an event for their computer team/club). Advisors, you can also use it as a way to evaluate your team leading up to our on-site tournament! Please watch this site for more information! You can also get updates on the Facebook page for the competition! In addition, you may be interested in the UCF Programming Team Facebook page, or follow us on Twitter (@ucfprogteam).